So much to say about this photograph. Where do I begin? For starters...the venue. 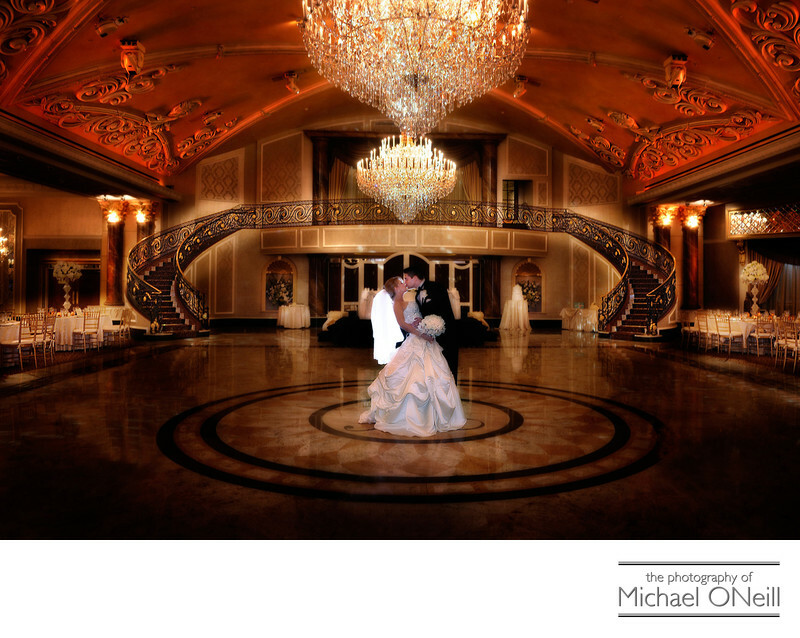 This image was captured in The Palazzo Ballroom at The Venetian in Garfield, NJ. Located near The Meadowlands this is probably the finest catering facility the state of New Jersey has to offer. The food is unreal! The service is impeccable. And if the picture doesn’t do enough to convey it: well, the architecture and decor are phenomenal! The event: This was a New Year’s Eve wedding. A popular date in the wedding industry, I usually find myself photographing a New Year’s Eve wedding every year. This one was truly a cut above. 275 guests at this spectacular catering venue. Ten minutes before midnight a pair of 12 foot wide screens descended from the ceiling and projectors displayed a live network television feed from Times Square, New York of the celebration that defines New Year’s Eve for the rest of the world.The couple: two of the most wonderful people I’ve ever had the pleasure of working with. Despite the extravagant nature of the wedding celebration they were hosting, they were two of the most wonderful, down-to-earth, people I’ve ever had the pleasure of working with.This image is one of my all time favorites, too. In color (as you see it here) and also in a toned black & white version; this image has garnered many awards in professional photography competitions on the local, state and international levels.If you’re thinking of having a New Year’s Eve wedding...Go For It! It’s the biggest party night of the year and you can count on anniversary fireworks and celebrations for the rest of your lives. I love New Year’s Eve weddings and would love to be a part of yours. Call me.